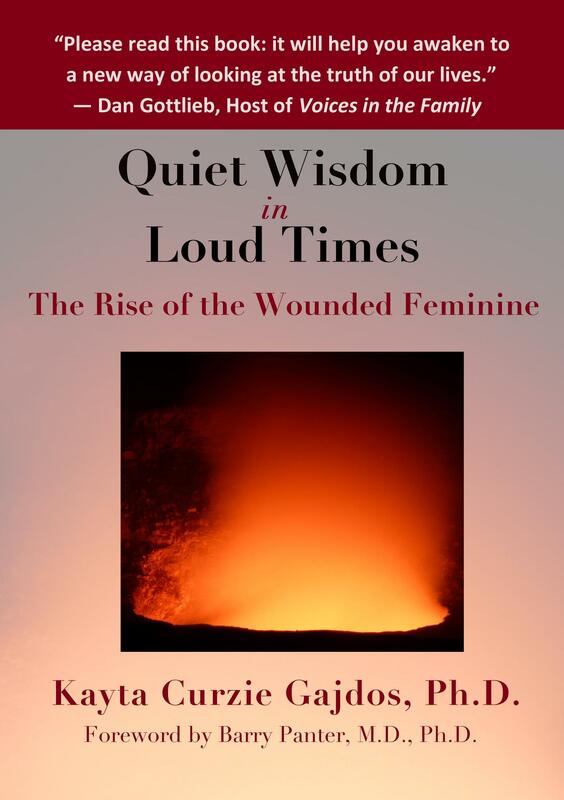 Authors: Kayta Curzie Gajdos, Ph.D.
Book Description: Quiet Wisdom in Loud Times: The Rise of the Wounded Feminine is now available through online and retail booksellers. Foreword by Barry Panter, M.D., Ph.D.
Commentary by JanStephen Cavanaugh, Ph.D. In The Girl Who Played with Fire, the second story of the Larsson trilogy, Lisbeth Salander, the protagonist, is shot by her father and buried by her half-brother. But at dawn, her hand rises from the grave. Stunning! Here it is: the rise of the wounded feminine despite patriarchy’s destructive violence. Quiet Wisdom in Loud Times considers her attempted murder by a brutal father and her resurrection despite it, to be the resounding metaphor of our times: we are in a global crisis of an old order of the patriarchy that wants to maintain the status quo of wealth and power. Yet the feminine principle, so wounded by the violence against it, continues to rise up. The wounded feminine principle refers to both women and men. Women have come a long way since the 1960’s, but that really isn’t the whole story. In fact, the story is not even about women only. It is about men also. It is about something, in fact, beyond both men and women, and that is the rise of the wounded feminine soul energy that needs to be part and parcel of all of us. Why now? We are at a very important time, where there are huge psychic upheavals happening. Right now life is still in patriarchal dominator mode. But this is not about gender. Women can be daughters of a rigid patriarchal structure as much as men can be its sons. Likewise, men, as well as women, can carry the collaborative, partnership model that attends to the feminine, relational aspects of life. Quiet Wisdom in Loud Times explores the rise of the wounded feminine principle, as well as its burials in relation to the environment, money, politics, and the media, with particular attention to the Larsson trilogy. By addressing the rise of the wounded feminine, Quiet Wisdom in Loud Times can help us face courageously the powers that be, while not collapsing into the indifference and apathy that define letting the patriarchy continue its violent way. This book elucidates how in relationship to one another and to the earth, the wounded feminine shall rise. Quiet Wisdom in Loud Times Copyright © 2014 by Kathleen Curzie Gajdos. All Rights Reserved. Copyright © 2014 by Kathleen Curzie Gajdos. All rights reserved. This book or any portion thereof may not be reproduced without the express written permission of the copyright holder except for the use of brief quotations in a book review or scholarly work. Cover Photo: Hawaiʻi Volcanoes National Park, 2010. Photo by the author.